The old saying that "variety is the spice of life" a very true fact in the success of Olds Engineering. In the same week recently when the propellers and shaft assemblies were delivered, a large consignment of boiler assembly components were sent to the Lakes Creek Meat Works in Rockhampton, and forty aircraft engine sumps were sent to Bundaberg. 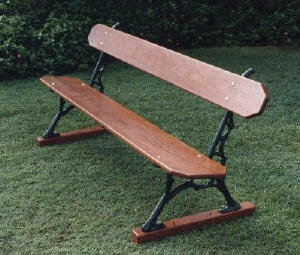 Half a dozen Heritage garden seats and table settings were sent to the Hermit Park School in Townsville. In the machine shop a die was being finished for a Gladstone company, while nearby four pairs of exhaust manifolds for Silver Ghost Rolls Royce cars were nearing completion for a customer in the south. The finishing touches were being given to locomotive headlight assemblies for a Melbourne order, while in one corner of the shop a brand new OHV 'Olds' engine was being run in prior to painting and delivery to a hire boat operator at Tin Can Bay. Besides this work the usual everyday orders were being processed to keep the wolf from the door. 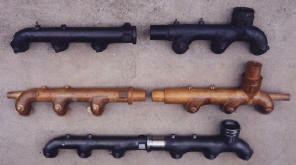 The 8.5 metre long propeller shaft assemblies were made up to order and fitted with 860mm diameter matched propellers. These were packed along with other items into three crates and shipped to Lae, PNG. 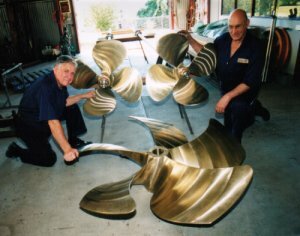 The 1480 mm diameter 5, bladed propeller in the foreground of the photo is a new generation design in propellers made in Western Australia. Ordered especially for Shulz Fisheries of Urangan it is expected to give greater fuel economy, such an important factor with the higher oil prices experienced today.